Each of these stories burrows deep into the often awkward and hilarious misunderstandings that pass between strangers and lovers alike, and that turn ordinary lives upside down. Ferris shows to what lengths we mortals go to coax human meaning from our very modest time on earth, an effort that skews ever-more desperately in the direction of redemption. There's Arty Groys, the Florida retiree whose birthday celebration involves pizza, a prostitute, and a life-saving heart attack. There's Sarah, the Brooklynite whose shape-shifting existential dilemma is set in motion by a simple spring breeze. And there's Jack, a man so warped by past experience that he's incapable of having a normal social interaction with the man he hires to help him move out of storage. 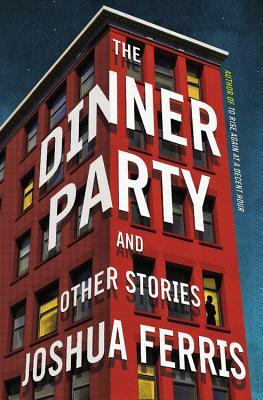 The stories in The Dinner Party are about lives changed forever when the reckless gives way to possibility and the ordinary cedes ground to mystery. And each one confirms Ferris's reputation as one of the most dazzlingly talented, deeply humane writers at work today. Joshua Ferris is the bestselling author of three novels, Then We Came to the End, The Unnamed and To Rise Again at a Decent Hour. He has been a finalist for the National Book Award, winner of the Barnes and Noble Discover Award and the PEN/Hemingway Award, short-listed for the Man Booker Prize, winner of the International Dylan Thomas Prize, and was named one of The New Yorker's "20 Under 40" writers in 2010. He lives in New York.